So as you read this I will have no internet. Oh, the horror. Sure, the service interruption is only for a few hours. And it’s moving day so I shouldn’t be on the computer anyway. No internet? No blog reading? How will I cope? By 10am I’m going to be like an addict jonesing for a fix. But during the day today won’t be the problem. The big problem is going to come tonight. Because we’re having the internet moved today but not actually sleeping at the new place until tomorrow. Why, you ask? Because the internet has to be there in order for Direct TV to come install my TV. He’s coming tomorrow. And a day without TV? WAY worse than a day without internet. Sorry internets, but it’s true. I *may* love TV a little more than you. But not much, I promise. I feel like that sentence was a Sophie’s choice moment. Like I’m telling one child I love him more than his sister. Thank goodness I only have one kid. Anyway, I’m sorry if I don’t link or comment as much as normal because I’m sans internet. And under the watchful eye of my husband who might give me the death stare if I try to blog while he’s struggling to move my granite-top kitchen table by himself. I made you these cookies so you’ll still like me even in my absence. It seems that putting ice cream in baked goods is all the rage these days. I’ve seen it in bread and in brownies. I thought, why not put it in cookies? 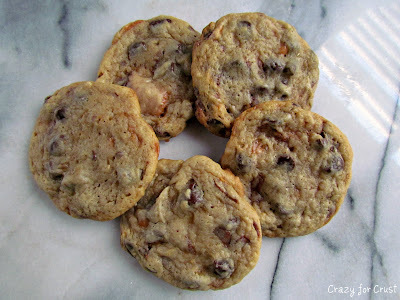 I modified this cookie recipe by adding one single-serve size cup of ice cream to the batter and upping the flour a little to adjust for the extra liquid. I also lowered the sugar because the ice cream is sweet. I used Dreyer’s Butterfinger ice cream because it looked good that day, but you can use any flavor you want. Just swap out the flavor and the mix-in (I used a chopped up Butterfinger) to suit your tastes. I have several combos I want to try, and yes, one of them involves Reese’s. These cookies turned out super moist and chewy. They almost looked raw when they were done cooking, but they were perfection. Absolute perfection. This is definitely a keeper recipe! And it would be great for Christmas…bring a little summer into the cold, dark nights. 3. Turn mixer (with butter mixture bowl attached) on low. Add eggs, one at a time, mixing completely. Mix in vanilla extract. Beat in frozen ice cream. It will take a minute or so to become smooth. Add flour mixture to the wet ingredients and mix until combined. Add chocolate chips and chopped Butterfinger pieces. Stir to combine. 5. Preheat oven to 350°. 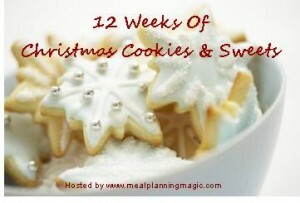 Drop by tablespoonfuls onto parchment lined cookie sheets. Bake for 10-12 minutes (depending on size). They will look not done, but once the bottoms are browned they are finished. Let cool for 5 minutes, and then remove from pans to cool completely. Flavor variations: Change up the ice cream flavor and candy flavor to suit your taste! I can’t believe I’ve never seem this before! Ice cream in a cooke – how interesting! Sounds awesome! 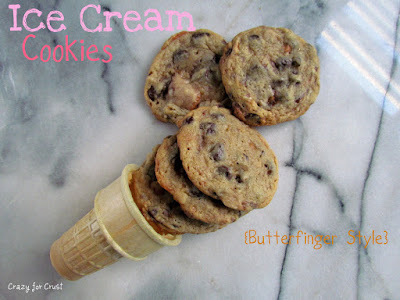 Ice cream cookies??!! Yes please!! I agree, a day without TV sounds like totally hard..like running a marathon kind of hard. Good luck!! 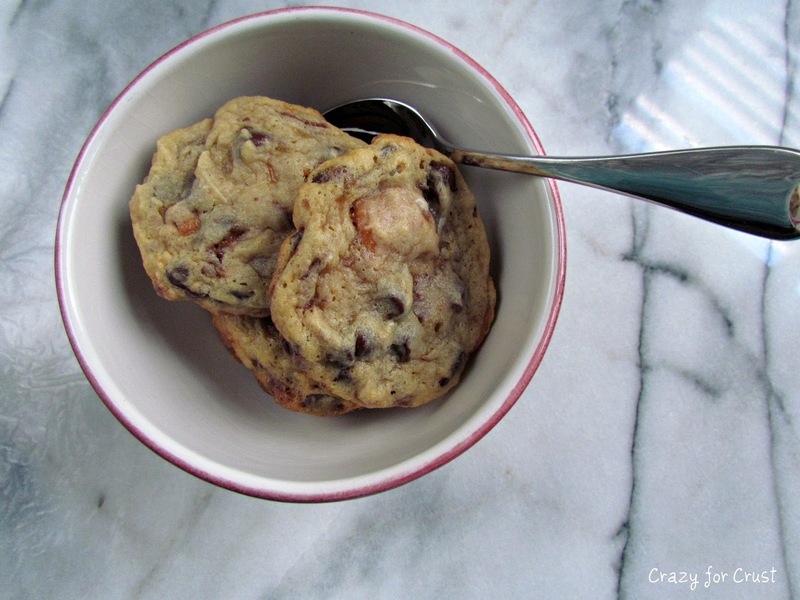 oh my goodness – how have I never heard of this – ice cream in cookies is brilliant!